Highlights: Copy files directly from Dropbox to OneDrive ( no need to download to your machine ) …. transfer from ftp site to ftp site ( handy for moving entire websites ) … great way to save space on your computer… great way to have redundant backups. I just finished upgrading a few client WordPress sites to the latest and greatest WordPress 4.0. Happy to say it went smoothly. Of course I’ve got all databases and sites being backed up daily via my automated website backup system. If anyone needs assistance upgrading their WordPress site please give me a call. Before I thought that I had pretty good “email deliverability.”…meaning that my emails were mostly reaching my customers and potential customers inboxes. Well it turns out that I was wrong! 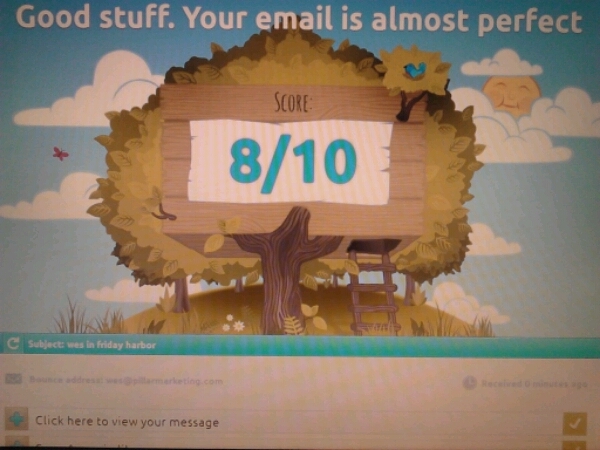 I used this handy email testing tool to illuminate potential problems and as you can see in the screenshot below my score was an 8 out of 10. I guess that isn’t a terrible score but I’m not happy with “not terrible” and neither should anyone in business. Aweber.com has had their newsletter sending service for many years but they have recently made some improvements that make the process of sending a newsletter actually enjoyable. 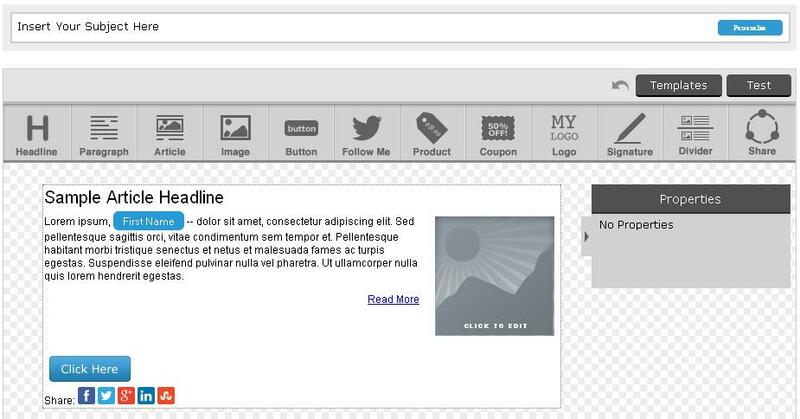 Their new “drag and drop” format makes it easy to build something that looks great in no time at all. My favorite drag and drop widget is the “article” … it drops editable placeholders for the title, description, image, and link. Just click on any of those items to add in your info and photo and link. Once that is done drag and drop another “article” to enrich your newsletter. I just whipped up and sent out a newsletter ( actually I scheduled it to go out tomorrow morning at 7 a.m. fully recommend AWeber.com for newsletter sending! In the past you could send a mass email to a few hundred people using your email client programs such as Outlook, etc… but this is not a good option anymore as companies like Comcast, Google, and AOL have setup tougher measures to catch spam. If you send the email out with your local email client, your message is sent out as fast as possible… and this rate of sending is what gets your e-mail address and IP address in trouble and prevents your e-mails from reaching your customers inboxes. Even if they are subscribed to your newsletter! To avoid this kind of issue I suggest using a company like SMTP.com ( $5 per month ) . They provide you with custom SMTP sending credentials that you enter into your email client send settings. They will not send the messages nearly as quickly and this will keep your IP address and e-mail account in good standing.